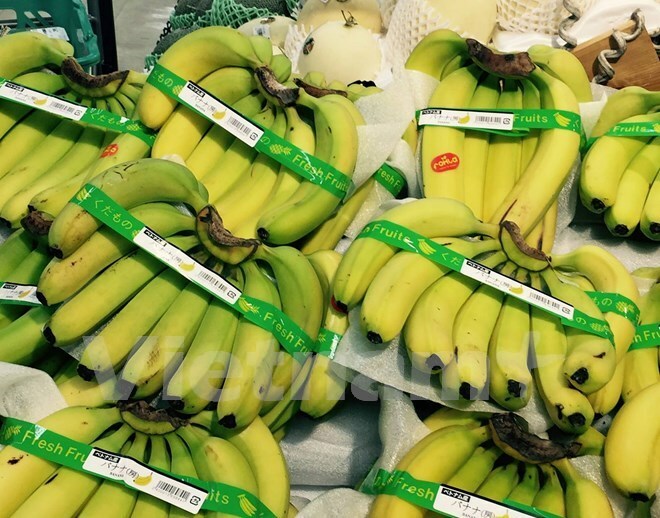 Tokyo (VNA) – Vietnamese bananas have marked their official presence in Japan’s market with the first bunches hitting the shelves of the discount chain Don Quijote on April 30. Nguyen Trung Dung, a representative of the Vietnamese Embassy’s Trade Office in Japan, said about 15 tonnes of bananas exported by the Huy Long An company are sold at over 10 Don Quijote stores in Tokyo and nearby Saitama and Chiba prefectures. Japan is expected to double its banana imports from Vietnam and sell them at more places in the near future, he noted. The Northeast Asian country consumes approximately 1 million tonnes of bananas per year. Up to 85 percent of its imported bananas currently hail from the Philippines. However, many Japanese companies say they want to seek more suppliers. Vietnam’s bananas were first shipped to Japan in 2013 as a step to survey the local market, and they were not present at big retail chains like Don Quijote. Hidekatsu Ishikawa, President of Vient Co. Ltd, said Japanese importers highly regard the quality of Vietnamese bananas as their sweetness suits Japanese people’s taste, and they are sold at competitive prices. Aside from Don Quijote, some local supermarket chains such as Chalenger in Niigata prefecture are also offering the product, he added.